STEP 1: Cleaner concentrate with descaler for deep cleaning and as a preparation for sealing with Nanotol Protector (STEP 2). Ideal for deep cleaning and decalcification of all surfaces in the sanitary area * and perfect as a preparation for sealing with Nanotol Sanitary Protector. The deep cleaner penetrates deep into the pores of the surface and removes stubborn dirt, limescale and water marks gently and thoroughly. Glass, ceramics and chrome stay clean longer and are protected against dirt and limescale. Nanotol Sanitary Cleaner is used diluted. 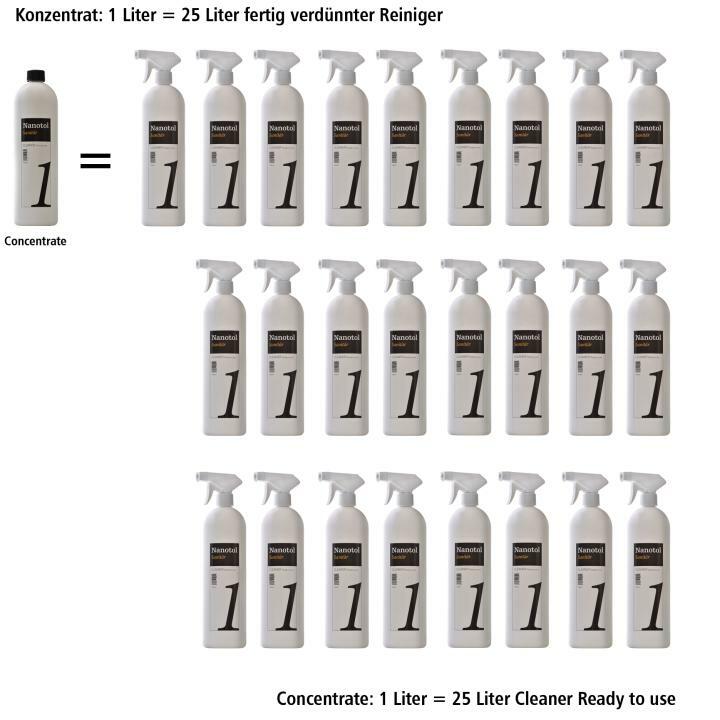 From one liter of concentrate you get 25 liters of ready-mixed sanitary cleaner. As a result, this powerful sanitary cleaner only costs € 1.60 per liter * and is thus cheaper than all conventional, usually less effective cleaning agents that descale from the supermarket shelf. (* when buying 1 liter of Cleaner concentrate). * not suitable for marble. Nanotol Sanitary Cleaner (deep cleaner - concentrate) is an effective and universal, powerful concentrate that keeps your bathroom clean. Lime scale problems will be a thing of the past. The great effect of the Cleaner removes stubborn stains of water on taps or shower cubicles – all without chlorine, alcohol, ammonia or annoying odor! Our Sanitary Cleaner can be used on all smooth, non-absorbent surfaces. Cleaning with Nanotol Sanitary Cleaner is a great preparation for a long lasting coating with Nanotol Sanitary Protector. Tiny nanopolymers can only enter the pores of the surface when they are really clean and without any limescale. 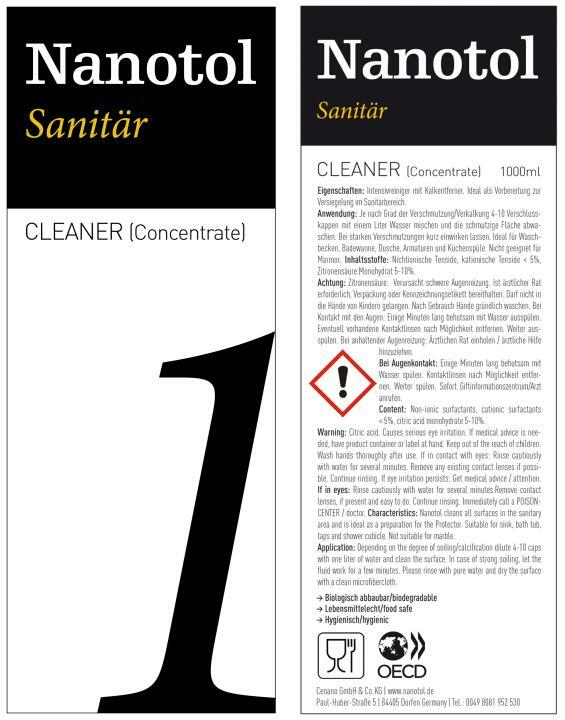 Nanotol Sanitary Cleaner cleans with high quality, nonionic surfactants and decalcifies gently but thoroughly. The Cleaner ideally prepares shower glass, sinks, faucets or tiles for sealing with Nanotol Protector. 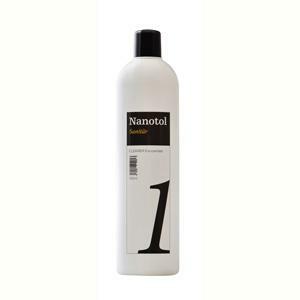 Nanotol Cleaner is easily biodegradable, chemically active and cleans hygienically. After cleaning the surface, tiny nanopolymers „fill“ the pores. Nanotol Protector should be applied thinly and as soon as the surface has dried, it needs to be polished with a microfiber cloth. This activates nano particles and smoothens the surface. Limescale and dirt can no longer firmly bond to the surface. The effect of the sealant can be replenished from time to time and lasts many years. 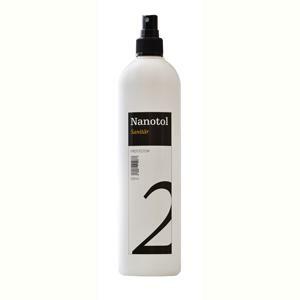 Instead of a conventional sanitary cleaner, use Nanotol Sanitary 2in1 in future. It cleans hygienically and prolongs the sealing effect every time it is used. 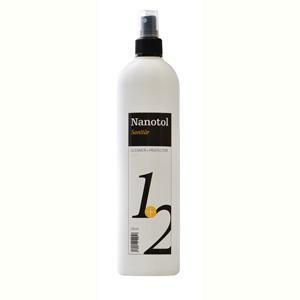 Nanotol Sanitary Cleaner is extremely economical. You can dilute it with water from 1:10 to 1:25, depending on the dirt intensity of the surface. For easy application we recommend to use the Cleaner Mix Bottle (Nanotol Cleaner ready to use) with a foam nozzle. Depending on the application fill 2-10 caps of the Cleaner with 900 ml tap water. The foam nozzle creates foam which has an intensive effect on the surface. For the best effect, let the Cleaner soak for several minutes. After max. 5 minutes stubborn dirt can easily be removed with a cloth and water, without scrubbing. Nanotol Sanitary Cleaner cleans all smooth surfaces like shower cubicles, glass and mirrors, taps, tiles, painted surfaces, plastic, enamel, ceramic and chrome or sensitive washstands powerfully, hygienically and deeply - everything gets clean without any effort. Nanotol Cleaner is very eco-friendly, not only due to minimal product use but especially due to its complete biodegradability. This is proved by numerous tests and certificates. Do not use on: Acid sensitive surfaces (including gold, silver, copper, aluminum), colored, old or damaged enamel surfaces, natural limestone (including marble, travertines).